The Aries horoscope for April 2019 signifies that this month will be one in which you will have to give the first response to your family matters as well as your emotional issues. Though you will also keep your professional development going, it will be at a slower pace as compared to family and sensitive matters. Aries zodiac sign will be patient when it comes to career goals fulfillment, and he or she will have to bear with that since success will come his or her way in a sluggish pace. Aries personality will have the opportunity to discover his or her goals and work tirelessly in attaining them. You will have full control of your business, and no one will be of importance in helping you out. According to the 2019 Aries horoscope predictions, you will be much aggressive in your love life, and this may bring total differences between you and your spouse. As per the Aries April horoscope, you will have choices of engaging in relationships with friends around you hence it will be upon you to accept such bonds or to decline them. About April horoscope 2019, this will be a hard time for pregnancies since pregnancy matters are hard to decide upon. Aries April 2019 horoscope reveals that you will have a slightly difficult time with your family since there will be lots of minor differences which in turn may bring about serious divisions. As a remedy, you will have to avoid brushing shoulders as well as involvement in interesting situations. Aries children will require more attention diverted to them due to their irritable characters and this will help them work smart when it comes to education. Based on the monthly astrology 2019 forecast, you will have a fantastic health status and enough energy to run your errands. Aries star sign will be involved in fitness exercises as well as intake of a balanced diet for the extra benefit of their health. The sun sign dates 2019 foretells that at this time of the year though things will be in your favor in the area of work, you will have to put extra effort into realizing your potentials. 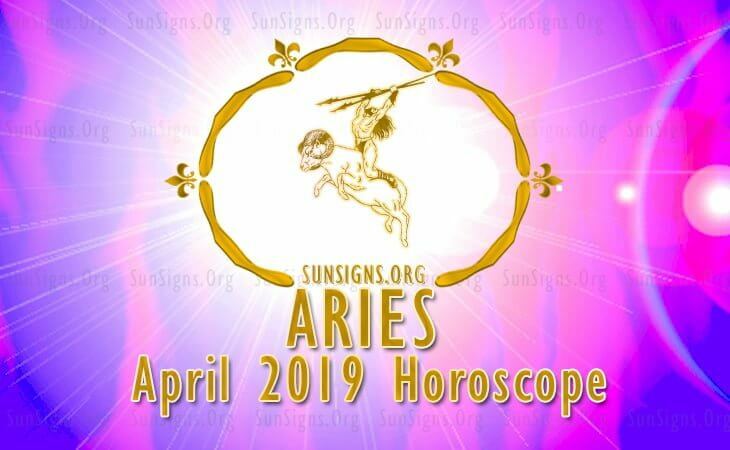 The Aries April 2019 horoscope predicts that you will have total financial success and the investments that you will risk binding yourself to will bring you significant returns. Aries yearly horoscope 2019 predicts that your intellectual investment in education will be at a successful rate since the stars are aligned to bless you. Aries sun sign will have success as their portion in whichever course and examinations they partake. As per Aries April 2019 horoscope, this month will be a favorable one when it comes to business tours. You will be successful in your travel plans hence no need for the postponement of the same. Please see Chinese Horoscope 2019.